Unplug' your family and get outside for a fun game of ring toss! 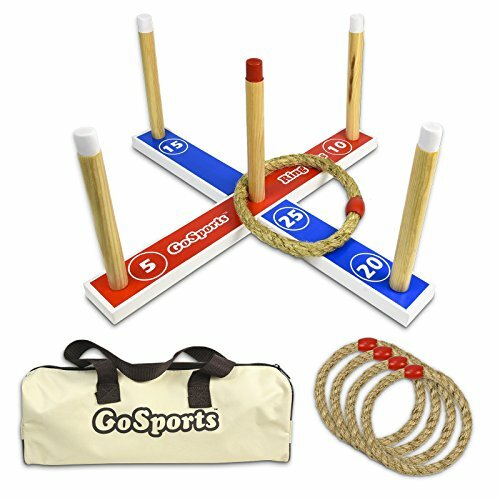 The GoSports Ring Toss set is a traditional lawn game that can provide hours of fun for all ages and abilities. In our society of ever-present TVs, Phones and Video Games, this is a great way to get family and friends together (indoors or outdoors) in an engaging game that requires no batteries or screens! The game is made to the highest standards using solid pine wood for the targets and robust rope for the toss rings. Our simplified design means the game can be assembled in seconds. The game has 5 scoring towers with varying point scores, so it is great for developing hand-eye coordination as well as basic math skills. Games can be played with anywhere between 1 and 4 players. The set includes a zip up carrying case to conveniently hold all the game's pieces. The game includes 1 target, 4 throwing rings, a carrying case and rules. Get outside today and thank you for supporting GoSports! FUN AT ANY AGE: Unplug the kids and enjoy the old-fashioned fun of ring toss, indoors or outdoors! LIFETIME REPLACEMENT WARRANTY: The GoSports Ring Toss game is backed by a lifetime replacement warranty! If anything ever breaks, we'll replace it with a new one - no questions asked! If you have any questions about this product by GoSports, contact us by completing and submitting the form below. If you are looking for a specif part number, please include it with your message.